So it’s time to decorate your home! Decorating your home is such an exciting adventure. Not only does it give you a chance to personalize the look of your home, but there’s truly nothing more satisfying than the feeling that comes from completing a home improvement project. If you’re looking to save a little bit of money on your home decor, one option you should consider is decorative window film. Whether you’ve recently moved into a new home or you’re in the middle of remodeling, decorative window film can provide your Salt Lake City home that aesthetic upgrade you’re seeing and help you stay within your budget. It’s great for creating privacy, adding color, concealing aesthetic flaws, and so much more. If you don’t want to deal with the mess of paint or wallpaper, consider installing decorative window film for your Salt Lake City home instead. Here are a few different ways you can incorporate window film into your interior design plans. Add frosted film to bathroom windows and shower doors. There are other ways to create privacy for your bathroom than installing blinds or curtains. 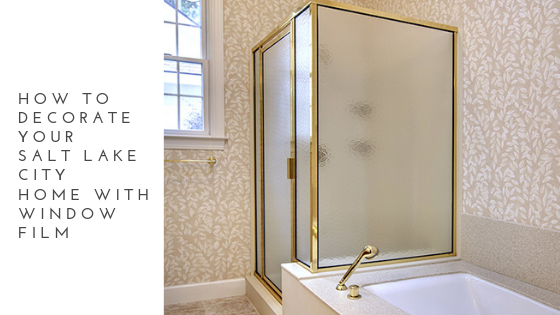 A simple frosted window film will give you the privacy you need while create a clean, classic look for your bathroom. Create a beautiful, vintage look with stained glass film. Stained glass windows are hard to come by these days. But if you’re going for a vintage or historic look, you could try installing a decorative window film with a stained glass design instead. Add stained glass film to the doors of your bar cabinet, entryway sidelights, or kitchen pantry to create a refined, elegant ambiance. Add window film to sidelights for privacy. Sidelights are great for letting in light, but they do put your privacy somewhat at risk. Keep your home private by adding a semi-opaque or textured window film to your entryway sidelights. Get a quote for your home improvement project today. Call Green Light Window Films to get an estimate on decorative window film application for your Salt Lake City home.